Stampin' Up!® PAPER PARTY PROMOTION! Stampin' Up! is having a Paper Party Promotion to kick off the upcoming holiday season! This month's Stampin' Up! Special of the Month is a Buy Three Get the Fourth-FREE Deal...three of what, you ask? 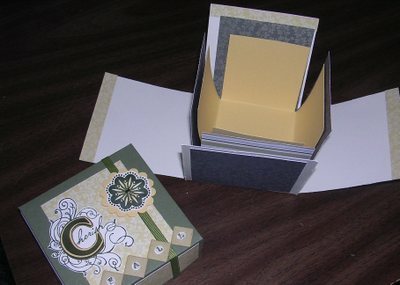 Why-Stampin' Up!® Designer Series Paper packs! This is a great way to get four packs of the same paper, or a variety-just in time for card-making, gift wrapping & tags, and scrapbooks for the holidays! These pretty 12 x 12 papers have double-sided designs featuring Stampin' Up! patterns and colors. Each package contains 12 sheets, 2 each of 6 double-sided designs. There are ten various themes to choose from in the Fall/Winter Collection and don't forget to check out the pretty Holiday Harmony Designer Series (also double-sided) paper offered in the Holiday Mini Collection which will be available only thru the end of November! 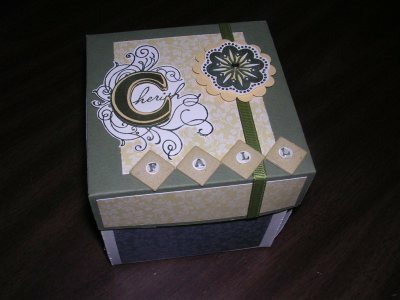 I love the selection Stampin' Up! 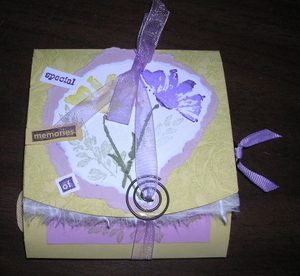 has come out with...here is a project I created for a class I offered recently-a scrapbook in a box, using Le Jardin D.S. paper. 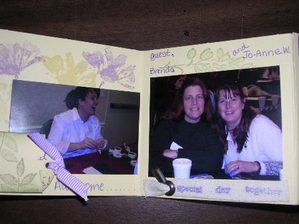 To find out about other classes and upcoming events I offer, visit my Events Page of my Stampin' Up! website! This is the box closed. 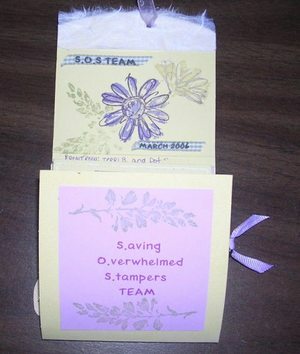 It is embellished using Stampin' Up! On Board Accents Chipboard, various punches including the very popular Scallop Circle Punch and also a lovely Rhinestone Brad in the center of the embellishment! 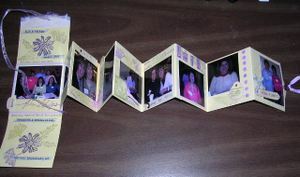 When opened, the pages spill outward-with plenty of space for alot of photos and journaling! The stamp sets used in the card are Illuminations and Season by Season. 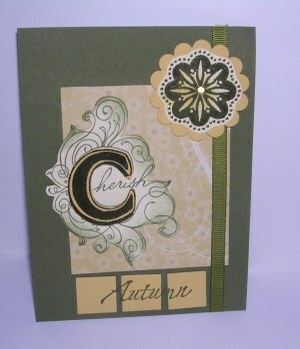 The "C" in Cherish is embossed and raised so it stands out. The Illuminations stamp set is so pretty and elegant looking! ONLINE CATALOGS link to shop. 2. Jot your items on the wish list and complete the form. 3. Add your contacts so I can follow up with them later! This is THE BEST way to get stamping and scrapbooking supplies YOU want for the holidays this year! TO PURCHASE THE PAPER PARTY PROMOTION SPECIAL NOW, select four Designer Series Papers from the Fall/Winter Collection or the holiday paper in the Holiday Mini Collection-you pay only $9.95 each for the first three packs (plus tax and shipping)-the fourth is FREE! The promo code for this product special is 111878. To order, E-MAIL ME.